Our cotton, hemp, and wool is grown or raised in compliance with organic agricultural standards. No dyes, bleaches, fire retardants, or other chemicals are used in the processing of the fabric itself. Manufacture of chemicals is not required. Chemical residues are not introduced into the environment. Humans and animals are not exposed to chemicals. When bedding is recycled and biodegrades, harmful chemicals are not returned to the environment. Natural fibers are much more comfortable next to the human body than synthetics; both in terms of moisture absorbtion and air circulation, they 'breathe' better. no more night sweats! We believe that all natural bedding should not be a luxury reserved for just the fortunate few. While maintaining the highest quality of craftmanship, we keep our overhead low in order to make this premium quality bedding available to as many as possible. In doing so, we hope to foster an increase in sustainable agricultural standards as well as decrease the amounts of chemicals and pesticides put into the environment. When you buy our bedding, you are contributing to a manufacturing process that is cleaner and more sustainable than current industrial practices. Our wool is grown, cleaned, and triple carded in the United States. Eco Wool is not exposed to fireproofing, carbonizing, bleaching, dyeing, or crimping. Additionally, strict standards concerning proper grazing methods and healthy veterinary practices are adhered to. The sheep do not undergo any type of pesticide bath as is common at other mills, nor are they exposed to herbicides and pesticides where they graze. Only when these practices have been followed can the product be called "Eco Wool." Further, no chemical flame retardants need to be added to wool--its lanolin is a natural flame retardant. Medical studies at Cambridge University have shown that lambs wool pads have a soothing effect on babies, resulting in better sleep, reduced stress, greater contentment and improved weight gain. Studies showing similar results have also been reported in the British Medical Journal, Lancet, and The Austrailian Medical Journal. Wool bedding is also beneficial for those with skin conditions such as eczema; see a recent article in The Telegraph for more information. Researchers find that when babies lie directly on lambs wool, their activity rate is lowered, producing a deeper, more restful sleep and promoting a faster growth rate. Hospitals in England, Australia, and New Zealand have used lambs wool pads to line their incubators for many years. "When I started working for KellyGreen Organics I was rather nervous about working with and around wool. All my life I have had reactions to any type of blanket or clothing that had the fiber in it. Imagine my surprise and delight when I was able to directly handle our beautiful, fluffy and clean wool batting without any of the allergy symptoms I expected!" Lambs wool has become a year-round baby item. In the summer, babies stay cool and dry when they are on lamb's wool because of natural air circulation through the fibers. In addition, lambs wool absorbs perspiration and moisture more than any other material. Of course, lamb's wool also keeps babies warm in cool weather. Pure lamb's wool soothes and comforts baby with a soft, swaddling effect, reducing stress and restless movement, and promoting deep sleep. Wool fibers also limit the growth of harmful bacteria, do not hold moisture (thus mold) and are naturally fire retardant. It's hard to get all of these properties in one fiber! Thank you, Mother Nature. Questions? Call us at 541-201-0808 between 8:00a.m. to 5:00p.m. PST. NATURAL HEMP FABRICS WILL APPEAR WHITER THAN BEFORE. WHY? A simple answer is that the traditional water retting process has been replaced with a natural “dew” retting process for hemp fiber. Our hemp and hemp blended fabrics are from China where hemp cultivation has been practiced for thousands of years. Traditionally, hemp would go through a water retting process in nearby rivers or ponds. Afterwards, the outer layer of the fiber could be easily peeled off by hand at farmers’ homes before being processed into yarn and fabrics at textile mills. Although this practice produced the most luscious hemp fibers with a lovely unformed and natural golden hue, it also created unclean water that flowed downstream from the river. The Chinese government has been implementing stricter environmental conservation policies over the past years. The most recent regulation puts a stop to this traditional water retting practice. In place of it, farmers have adopted a “dew” retting process, leaving the hemp plants in the field after harvest. With this method, retting now is totally dependent on natural rainfall, morning dews and winter snows. The naturally retted fiber is gathered in early springtime and transported to the mills for further processing. While this process creates the least pollution to the environment, the raw fiber, due to the variable exposures to nature, is grayer, more spotted and rougher compared to fiber retted with the old water method. To enable it to be woven and knitted with even color and consistency, the raw fiber now must go through an eco- friendly hydrogen peroxide bleach first, which results in the whiter color that the fabric now has. Please note that once the old water retted hemp fiber runs out this year, all hemp and hemp blended fabrics will appear whiter than before. Feel free to pass on this info to your customers so that they’ll know the reason for this change, too. Natural fibers have a history of being considered the fibers that are easiest to live with, valued for their comfort, soft hand and versatility. They also carry a certain cachet: cashmere, silk taffeta and 100% pure Sea Island cotton convey different images than does 100% rayon, pure polyester or even Ultrasuede, don’t they? 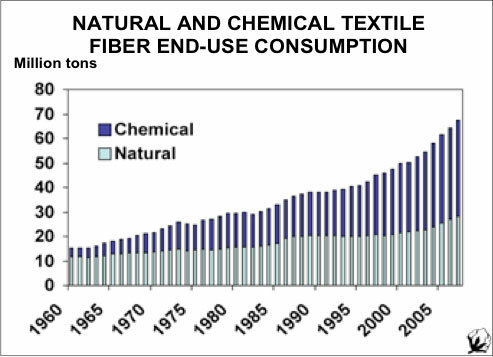 And natural fibers, being a bit of an artisan product, are highly prized especially in light of campaigns by various trade associations to brand fiber: “tric of our lives” from Cotton, Inc. and merino wool with the pure wool label are two examples.